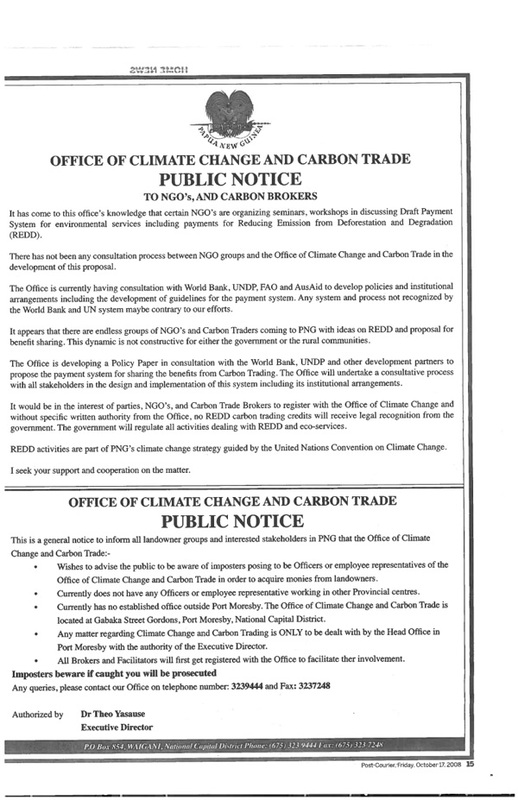 The notice, which appeared in the PNG daily newspaper Post-Courier in October, also warns the country’s indigenous landowner groups, which control most of the country’s forests, to “be aware of imposters posing to be officers or employee representatives of the Office of Climate Chanage and Carbon Trade in order to acquire monies from landowners”. Is is not known whether specific NGOs or carbon traders have sparked the government’s concern. The warning to landowners about uncrupulous REDD project developers is no doubt a sensible move – especially in a country where trickery has widely been used by logging and plantations companies to gain access to forest resources. However, it also illustrates the dangers in the current REDD free-for-all, and the likelihood that tropical governments will seek to capture all finances as they start flowing from REDD projects. Prominent PNG lawyer Peter Donigi recently warned that the state was trying to ‘grab land’ in order to benefit from REDD. Despite this, PNG’s R-PIN has already been approved by the Bank, thus undermining its claim that all plans for the FCPF would have to be subject to wide consultation. PNG currently ranks 151 out of 180 on Transparency International’s Corruption Perception Index, and has been moving steadily downwards since the index was first launched. 1.The office of Climate Change & Carbon Trade has no Law and Policy in place to govern and follow, so goes that the notice have no effect. Null & void.Speaking on the assumption of authority. 2.The Directors position was not advertised, hand picked and placed there for convenience. 3.Thus doubts whether he is really a Scientist,specialising in the fields of Science like Biology, Chemistry, Environmental Science, which that Office calls for. 4. Works in isolation, does not utilise the services of professional Scientists in the country who specialise in climate change.Only for the Poland meeting did they sought their assistance. 5.Campus baffons are believed to have been employed and could still be there. 6.Staff going on a frenzy, scrambling for information on Climate Change in offices and institutions.An indication of inexperienced and unqualified persons being offered positions.From News paper report. 6.Alleged that a known criminal is/was employed by the office. 7.The notice is to divert public attention, and create middleman to handle REDD funds and make it miserable for the real resource owners. 8.Two companies already registered to trade in carbon.Why the hurry when there is no Law and policy and do they have forests themselves? You cannot be riding on other people,s forest. 9.Starting from the top (Political & Administrative) down to the tea boy/ enquiries clerk,the entire office is regionalised by an ehtnic group and does not represent a true image of an office that belongs to the Nation. 10.Talk in the air of briefing out tasks to NGOs by the Office of Climate Change & Carbon Trade.Good one, give us on Contract on our terms and conditions. 11. Finally, the Govt got everything, the timber, oil, gas, minerals;everything,and even legislated against citizens by allowing Bank of South Pacific to steal from depositors accounts.Now, they are after carbon. These carbon cowboys will be met in the carbon field. Please include me on your mailing list for updates, newsletters, etc. Waka you are spot on with some of your observations. Its all about the money coming in. those grubby hands still want a piece of everything. REDD and other Climate Change initiatives are new frontiers and needs every hands on deck to purse and the Office of Climate Change in PNG is no exception. What we need are positive inputs on how this can be done. I come from a region in Paua New Guinea where there is thousands and thousands of forest and trees not logged or cultivated, untouched. Assist please. Wai Kitts… If you need help contact me at terryzjm@hotmail.com with your questions or possible help witth REDD assistance..